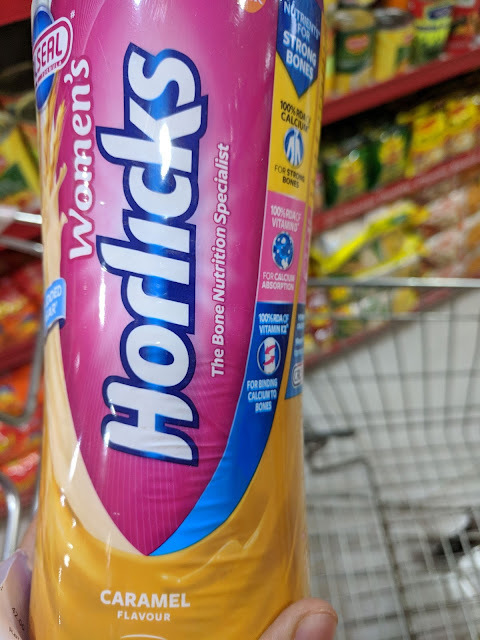 Come Women’s Day or Mother’s Day, there will certainly be an ad campaign from Women’s Horlicks that talks about the importance of bone density and calcium through a very emotional ad story plot. Irrespective of whether the ad creates a sense of hope or fear, most urban women in the country will be convinced at the end, “Yes, I need to supplement my diet with this health drink, now that I’m in my early 30s”. Ads can strike such an emotional chord, that we might overlook the essential facts. Usually, I start off my analysis from the first ingredient. But this time, let’s start from the last. 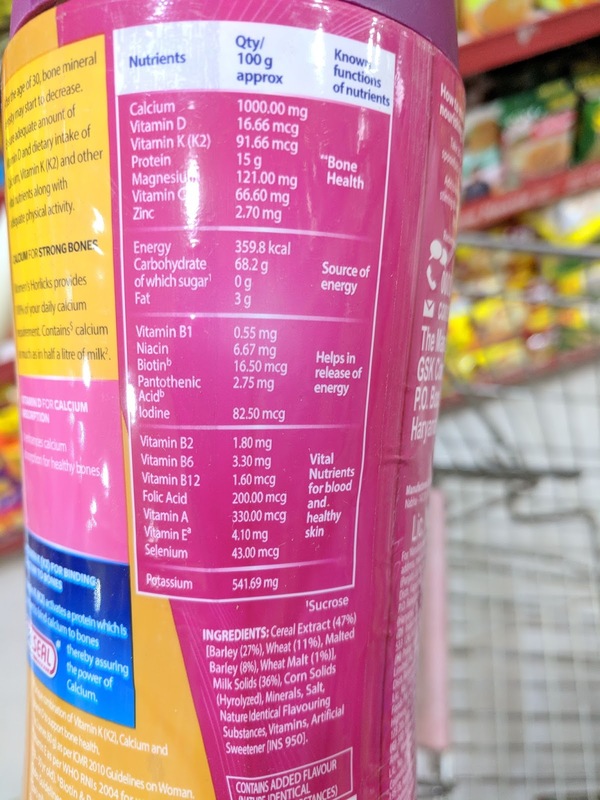 The packaging states “Contains Acesulfame Potassium. Not recommended for children”. Acesulfame K is a calorie-free sweetener up to 200 times sweeter than sugar and as sweet as aspartame. From this source, Acesulfame K contains the carcinogen methylene chloride. Long-term exposure to methylene chloride can cause headaches, depression, nausea, mental confusion, liver effects, kidney effects, visual disturbances, and cancer in humans. The FDA recommends that acesulfame K is safe up to an acceptable daily intake of 15 mg/kg/day of body weight in the U.S. In Europe, the acceptable daily intake is slightly lower, at 9 mg/kg/day of body weight. The bottom line is that there haven’t been any long-term studies/tests on the effects of Acesulfame K and there have been many controversies surrounding its approval of use. Not sure if it was a spelling mistake in the packaging, because Google search came up with results for "hydrolyzed" corn solids. Corn syrup solids come in powdered form and it is another form of sugar (dextrose or glucose depending on the processing). Consuming very large amounts of corn syrup solids at one time can cause a significant spike in blood sugar. If you carefully notice the nutrition table, it says “Sugar - 0g” with a footnote(1) that says “Sucrose”. This means that Sucrose in this pack is 0g but the amount of dextrose or glucose is not shared. My personal belief is that I would rather get these vitamins and minerals from natural sources like grains, fruits and vegetables, rather than consume synthetic supplements on a regular basis. 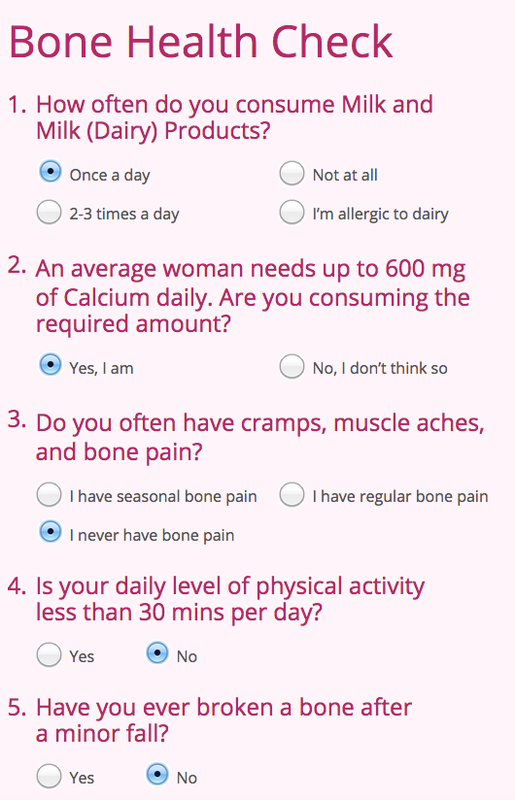 As I wrote in this earlier post, there are plenty of plant-based sources of calcium for good bone health. As a woman in mid-30s, I don’t believe in consuming such artificial, “cleverly-marketed” health drinks for bone health. 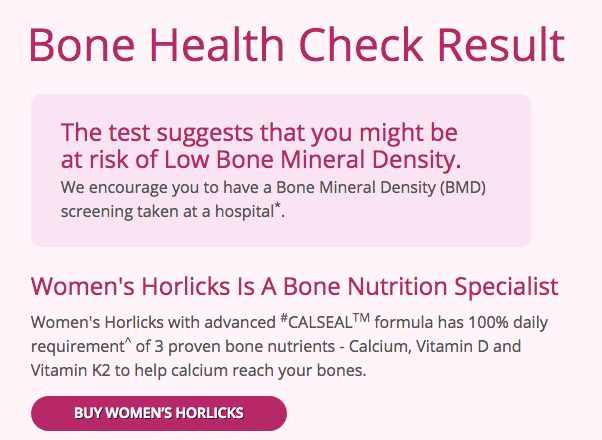 BTW, I took the "bone health check" survey in Women's Horlicks website. Here are my responses and the result shown. As you can see, the ONLY factor that this survey considers to qualify for good bone health is consumption of dairy (2-3 times a day), even if your calcium intake is good and you exercise everyday. On the contrary, dairy products are acidic and leech calcium from bones. I have noticed many children who regularly drink milk but have cavities. Same goes with senior citizens who drink milk regularly but have osteoporosis. For good bone health, staying physically active, regular Yoga, consuming less of acidic foods and exposure to sunlight are what I rely on. Before we include more calcium in our diet, it is imperative we stop the leakage. Acidic foods leech calcium and other essential minerals from our bones. It is highly likely that there will be a new product launched for the teenagers / young adults - one segment that hasn’t got much attention compared to others. Whichever segment you belong to, before you buy a pack, do take a look at the ingredients, read about them and understand the nutrition facts. Do invest that time and effort to #StandStrong and for the sake of your good health. Hey! This is a great website. I found it so interesting. It has all the relevanat information. Hey as a doctor nearing 30 with diabetic and hypertensive parents and having pcos I am always very cautious about nutrition. Even then I keep faultering . This blog keeps motivated. Thanks a ton!